Today has been one of the laziest days I’ve had in a long time. Last night I had plans to go see one of my nephews play soccer this morning. I was up and almost ready to leave when the rain started. A quick phone check and the sound of thunder put an end to those plans. Since it was only 9:00 AM, I got a jump start to the day and made the sauce for tonight’s lasagna dinner. Did some laundry and fell sound asleep. I wasn’t home by myself so there wasn’t any danger, but I kept waking up to check the pot which I left on a slow simmer. Finally woke up completely. (I'm still not sure about what was going on with the pot checking, but the last time I got up to check I turned it off.) Washed,dried and folded more clothes, got on the computer, watched Sci-Fi, started to put the lasagna together, needed one ingredient, made a grocery store run, put the lasagna in the oven to bake and took pictures of the finished Lilac Lace socks. 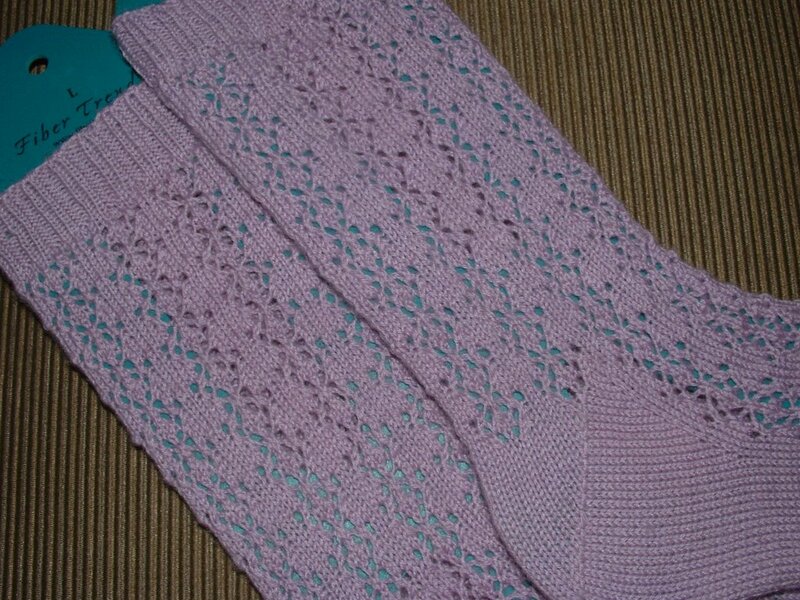 The lace pattern is Shetland Eyelet Pattern from A Treasury of Knitting Patterns by Barbara Walker. My preferred method of working is toe-up using the figure-eight cast-on. Size: Women's 9 1/2 for narrow foot. Length: Mid calf as are most of my socks. Dinner was great and as usual my brother and his family arrived almost an hour late. Needless to say, after all these years I still haven't gotten used to them always being late but they have definitely gotten used to me starting without them. Even though the soccer game was canceled, my nephew still had a busy morning. He arrived eager to demonstrate the newest thing he's learned ... jumping rope! Yesterday when he was over my sister gave him a jump rope. She teaches elementary school PE and he's in 5-year old kindergarten. He spent the remainder of the time at our house trying to jump over the rope. "Boo-boo", "Snickums" or "Jay", he answers to them all, is a pistol and has delivered some of the most surprising insights and one-liners I've ever heard from a child or an adult. 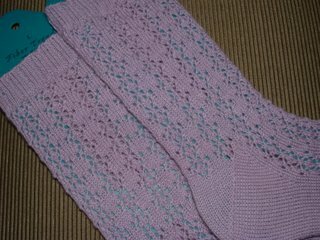 He marveled at the Lilac socks, they were left in the room from the photo session, which in itself was surprising because he commented just last year that I'm "always reading or doing some knittin'." One thing is certain. He knows his "Aunt B" very well. It was a rainy one here yesterday, too. Lovely socks. Very pretty for Spring. 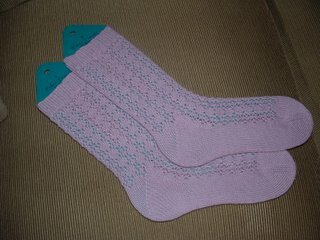 Socks photograph so much better on blockers. I can really see how beautiful they are.